This firmware is intended to upgrade the AQ1200 to the latest version. Press [SETUP] key and [Product info.] software key to display the firmware version. In case updating firmware from R1.11(or less) to R1.12(or later), internal memory must be formatted before update. Please do the file backup and memory format as following procedure before update. Copy the file in AQ1200 to PC by PC operation. Copy the file to USB memory. Added support for DI-1000 (Lightel.Inc). Added support for the /SPM, /SLS or -HM options. Added a Total Loss mode to calculation. Added a Total reflection mode to calculation. Start Menu setting：The bug was fixed; it may be hang-up when turn on the power with "Event mapper". Label function：Adapted Label displaying and data saving. The Finnish：Added language of Finnish to HE model. Pass / Fail judgment has been available in Multi core measurement function. Event mapper function：Detected Event result would be shown by Map display. Operation feeling：Key response improving, Doable crick Setup key to go to FILE menu. Bug fix in file copy function. Improved the trace in short distance range measurement. Improved event search precision of END point. Added a function of indicator work completing. Added a remote control command which is SOR/CSV data sending *ability of getting current wave form as SOR by remote controller. Support a USB memory with low transfer speed. Added a capability to assign functions to software keys (F1to F5) of TOP menu. 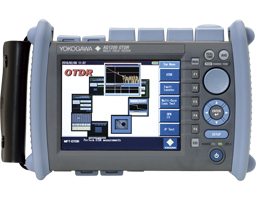 Added a capability to select display items for OTDR event table. Added an indication on the approximation method (LSA/TPA) being used to OTDR analysis. Added an indication of free memory space to the file list. Added a shortcut button to turn on the laser during OTDR mode. When the Operation Lock Setup (Light Source Lock) is active, it requires a secret code (PIN) to turn on the Laser (as a fail-safe). When the Operation Lock Setup (Measure Mode Lock) is active, it requires a secret code (PIN) to switch measurement modes from Simple to Detail or Multi WL (as a fail-safe).